One of our best selling compact desks, the 27" wide STAK49 is a narrow computer desk with a removable top printer shelf and a sliding keyboard tray. 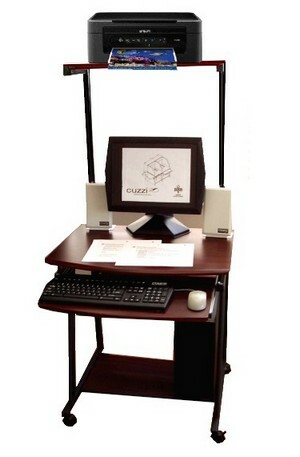 It can be used as a corner desk or be added next to another desk creating a "L desk" type layout. 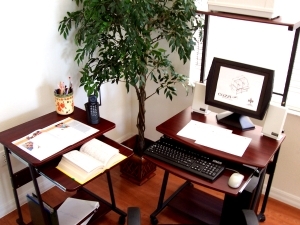 A rapid, cost-effective and flexible solution for adding multiple workstations in a small working areas (call centers, customer service, test centers, classrooms, exam rooms, etc...), saving time and budget in office furniture. 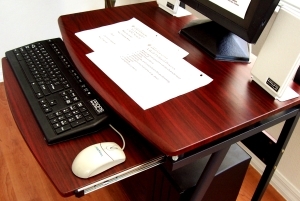 Many times also used as a laptop desk or table, placing the laptop on the tabletop and using the keyboard shelf for literature or extra writing space. 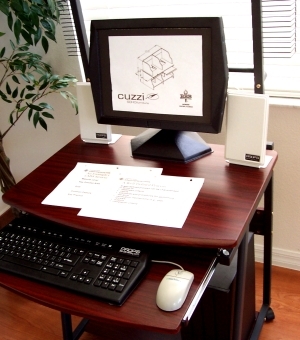 Easily increase your work area by adding different CUZZI workstations and carts, like the 5806 model shown above (left).